We are holding a Senior Phase Information Evening for S3, S4 and S5 students and their parents/carers on Monday 29th January from 6.30pm. Please come along and find out more about available courses, qualifications, wider achievement, positive destinations and general information for session 2018-19. 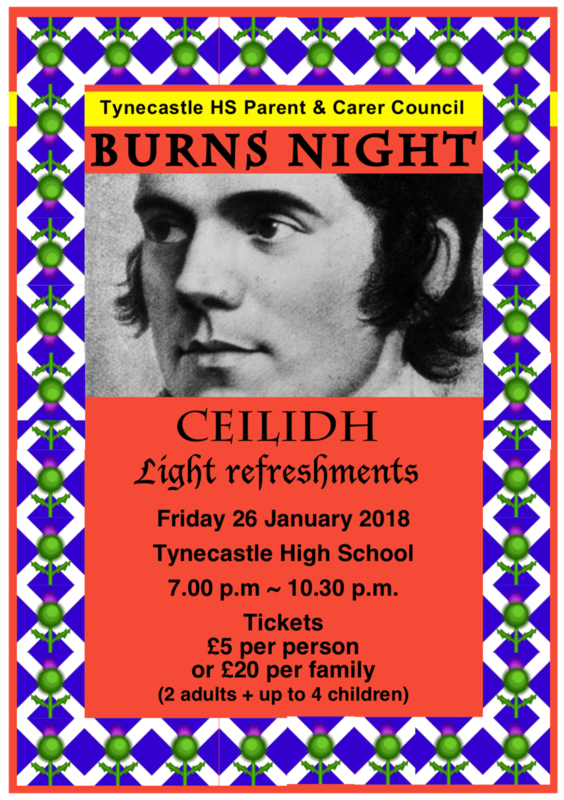 This year’s Tynecastle High School Parent and Carer Council Burns Supper with live ceilidh band, Scottish buffet, licensed bar and light refreshments will take place on Friday 26th January 2018, 7pm – 10.30pm in the school. Tickets are now available from the school office – £5 per person, or £20 per family (2 adults and up to 4 children). Best wishes for 2018 and we look forward to seeing you there!